ONE of the most amusing news items that appeared in almost every leading newspaper of November 14, 1995, was about the goings on at the conference of the International Tobacco Growers' Association (ITGA) held in Bangalore. The Hindu said that Karnataka chief minister, H D Deve Gowda, "did not subscribe to the popular notion that tobacco was the sole cause of cancer, tuberculosis and other diseases". The rrGA president, Hains Graslow, said that the World Health Organization (WHO) figures on tobacco- related deaths were not realistic. The conference seemed targetted at dissuading the Central government from going ahead with the ban on tobacco, as it would affect more than 45 lakh people directly or indirectly, for whom this was the main source of livelihood. Since the '50s, there has been sufficient scientific evidence to evaluate health risks due to cigarette smoking. In 1962, the Royal College of Physicians, London, reported, "Cigarette smoking is a cause of lung cancer and bronchitis and various other less common diseases." Subsequently, a mammoth, 150,000-words report was released in 1964 in the us by the surgeon general's advisory committee on smoking and health. The principal judgement was, "Cigarette smoking is a health hazard of sufficient importance in the us to warrant appropriate remedial action". By 1965, the us government made it compulsory for each cigarette packet to carry- a label stating the health hazard. In 1971, the Federal government banned cigarette advertising on radio and television. By this time, at least 80 per cent of professional health and research organisations, medical societies and government health agencies in the us and other countries concluded that cigarette smoking is an important health hazard. Radio andtelevision bans on tobacco-related advertisements were already in practice in Britain (1965) and Italy (1962). Our country too has the ban, as well as the mandatory warning in every packet. 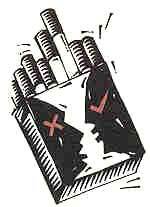 Tobacco industry itself has some kind of self-censorship in advertising and ad messages are surrogate, not direct. Young people are the industry's new-customers. In 1992 alone, the industry spent more than us $5.2 billion on advertising; only the automobile industry spends more on advertising in the us. Sporting events offer the biggest exposures, besides bill-boards, consumer items like hats, T- shirts, jackets or lighters. Studies show that tobacco advertising and promotion are especially effective with young people. Robert F Perry, MD, Pee Lee Clinic, Wilmington, North Carolina,.says, "Real progress will occur only when we enact laws that treat the marketing of tobacco products to young people as the felony of child abuse." A news item in the September 23, 1995 issue of the British Medical Journal says that the Olympic Games will ban tobacco advertising. A smoke-free policy was in force at the Games in 1992, but was largely ignored. Thus, we have two distinct scenarios. One demonstrates an utmost concern about health risks, with emphasis on measures to control the growing number of young addicts. 'The other is of unabashed advertising and promotional efforts by the industry. In India, notwithstanding the ban on radio and television advertisements, there appears to be very little anxiety and almost negligible efforts towards deaddiction and prevention of growth of new addicts among youngsters. No doubt, more and more areas are now-a-days being declared 'no-smoking zones'. However, covert encouragement to tobacco use is evident. What else is the Wills World Cup all about? These four white letters on a red band are omnipresent. One sees them thousands of times in the field or on the television sets. Otherwise so innocuous, it is an extremely sophisticated but penetrating advertisement and promotional gimmick for smoking and the use of tobacco. The Wills World Cup, 1996, is expected to be the most expensive, most widely covered, and the most watched world cup ever (estimated audience 1.5 billion), reports one news- magazine. With all this regular marketing blitzkrieg on, can parents, teachers, elders and counsellors have the moral courage and.strength to ask youngsters not to smoke?